Jewelry was similar to clothing when it came to portraying rank and wealth. At the beginning of the Medieval era, the only people wealthy enough to afford jewels and fine metals were the nobility. However, with the expansion of trade and commerce and therefore a more developed and larger middle class, more people could afford jewelry. By the fourteenth century, the wearing of it became so common that, like with clothing, sumptuary laws were passed restricting the amount of people allowed to wear jewelry, based on amount of land owned and social ranking. Of course, these laws were largely ignored and many people of the middle class wore jewelry anyway. This caused the nobility to have to boost the extravagance of their jewelry in order to further distinguish themselves from the middle class. And, of course, the middle class caught on and did the same. So the cycle continued and jewelry became more and more lavish and embellished. The interesting thing is that jewel-cutting was still underdeveloped, so jewels then would have been much more dull and less colorful than they are now, and yet they were still extremely valuable. The main items of jewelry were brooches, belts/girdles, coronets, and necklaces/rings. fastening belts. They were usually round, solid, and fairly small. However, they soon became much more decorative, at first having intricate reliefs worked in them with silver or gold. These reliefs could be of geometric shapes, designs taken from nature, inscriptions, or crosses (Fig 1). In the middle of the thirteenth century, they became circles of gold set with jewels, with a movable pin in the center (Fig 2). During the fourteenth century, many were shaped as hearts. Hat brooches became popular during the fifteenth century and became even more extravagant, practically dripping with jewels and pearls. Thus, brooches also came to signify rank and wealth just as much as normal clothes. Belts/Girdles. The girdle was used by women for the majority of this period. It was often made of leather or silk and set with jewels or ornamented with gold and silver. 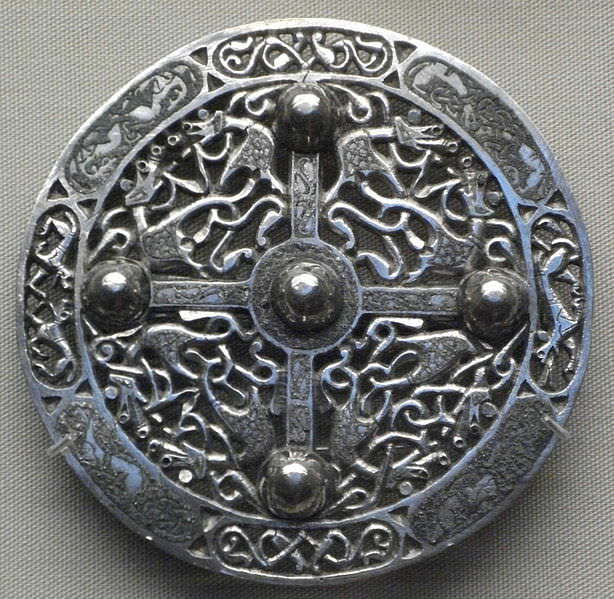 The buckle would also be well-decorated (Fig 3). During the 14th century, girdles began to be replaced by hip belts, which were usually made of metal and worn straight around the hips over the cotehardie. These were much more embellished with jewels and such since they could carry more weight. They were usually made of separate plaques connected by links. Men could also wear these and attach their swords to them, on the left side if they were right-handed and on the right side of they were left-handed. These belts were so thick sometimes the hips would appear to be much wider. of nobility, especially royalty, and so they were extremely lavish and intricate and were made of the most precious metals and jewels. Coronets, however, were smaller and plainer circlets. These could be worn by the nobility and were first worn around lords’ helmets. Women soon adopted them to wear over their veils. They were made of thin gold bands or small jewels linked together (Fig 4). During the 14th century women began wearing them much larger, similar to the hip belts. Cauls were also often made of gold or silver and studded with jewels. Necklaces and Rings. Rings were worn to signify betrothal, royalty, or high nobility. They were the only piece of jewelry to decrease in size over the years. By the 14th century they had become smaller and less unwieldy, and were usually just bands of gold or silver with an inscription or a few small jewels. Signet rings were heavier than normal rings and so they were worn on the thumb. During the 15th century, women began wearing rings more often than men. Their rings were much more delicate and small than the rings men wore. Necklaces only began to be worn often during the 14th century. They began as strips of fabric or ribbon that were embellished with jewels, but developed into intricately jeweled metal chains and pendants during the 15th century. Women began wearing delicate necklaces made of pearls with jewel pendants (Fig 5).